Research from the RedSeer group shows that the Indian online food delivery market is set to hit $4 Billion by 2020. This is sparked by the demand growth on one side and the technology advancements on the other. AI has reached a point where some of the top Artificial intelligence development companies are designing unique and innovative features every quarter. Innovation is being seen across the board, with many companies opting for mobile and cloud-driven AI integration. With advancements in NLP and Machine Learning, AI is getting ready for the next stage in disruption. AI has also led to multiple custom web development companies working with startups that are in the food domain. They’re competing with major corporations in the field and are giving them tough competition based on their unique AI-infused offering. While many food ordering apps are acquiring these companies, some of them are competing with them directly. The AI in the food domain industry is cropping up and allowing all companies to gain technological leverage in the field. “In addition to our dedicated delivery fleet (the largest in the country), AI models help us ensure that we provide a highly accurate delivery promise to our customers and efficiently meet that promise. We use AI/ML across this three-way marketplace to deliver a wow customer experience, unlock business growth and drive operational efficiency” – Dale Vaz, Head of Engineering and Data Science, Swiggy. AI enables companies to plan in a more systematic manner. Many of the top artificial intelligence companies in India have dedicated teams serving the fast-growing food ordering market. There is a significant impact on the way these companies estimate demand for the next quarters. There is also leverage in the domain of planning for spikes and dips that occur throughout the business lifecycle. From a demand standpoint, there are companies working to improve their logistics using AI as well. With the help of machine learning consulting, companies are able to plan their delivery routes and logistics in a more efficient manner. While food ordering is a resource-intensive side, the delivery and logistics domain are equally complex. Every delivery agent’s time must be optimized with the right route to ensure constant movement and break time. This efficiency-oriented model must be optimized using AI and Machine Learning. Swiggy, as an example, uses AI to plan the best routes possible for its fleet. The company acqui-hired a two-person AI startup named Kint.io to strengthen their AI technology and integration. It’s not just about giving the best route to the nearest delivery agent, it’s about optimizing the demand side as well. AI is being leveraged to make better listings for consumers to choose from. They’re also assisting in optimizing the way in which we order from our restaurants as well. The data is being fed back into the algorithm, while there are tests running simultaneously. Iterations of the apps are then launched into select markets to review the response. Driving insights from complex data sets require the power and scale of AI to fully function. 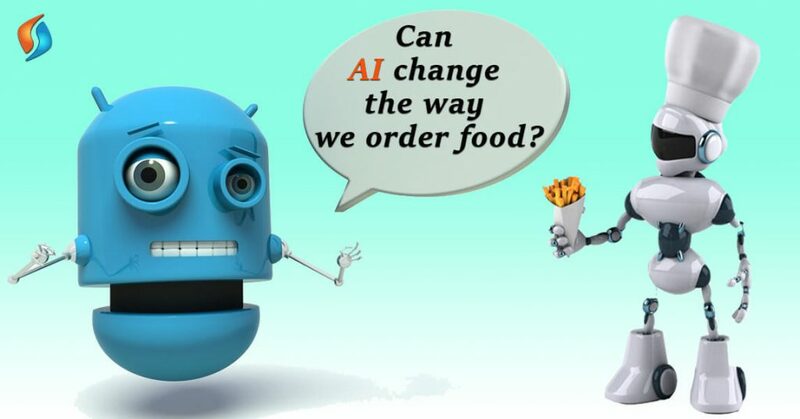 Food ordering firms are also working with AI consulting services companies to ensure that they’re able to drive maximum results. From demand generation to optimization of app inventory and space, there are advantages to adopting AI as a core technical strength. It’s changing the way we order our food, from the way that the app is designed to how we see listings. For the food ordering apps, it’s a more efficient way to optimize their service offerings. The AI is also increasing the scale at which data can be analyzed. By using advanced algorithms, big data analytics solutions and Machine Learning processes, data can be analyzed at a much leaner pace. Insights can be driven to improve the core methodology behind much of the innovation taking place in these companies. With faster data processes, companies can innovate rapidly, especially in the food ordering domain. The talent model is evolving as well. More data engineers are being needed to work on complex AI challenges. There is lesser demand for low-skilled workers that may become redundant after AI is introduced. There is also an additional shift in the way that AI is being perceived in the food ordering domain. It’s being funneled through the tech ecosystem, but being looked at from a strategic perspective. That’s where much of the talent is emerging – in areas that work well with AI. Food ordering companies, globally, are also working with business automation consultants and vendors who can produce AI solutions at scale. They’re working with top AI development companies to create a more competitively compelling product. While delivery and logistics is one domain, they need to watch out for local and global competitors who are expanding in their domain. Companies like Uber Eats and Post Mates are also using AI to change the way we order our food worldwide. We’re also seeing multiple fast-food chains using AI to enable better food ordering experiences. These range from Alexa-voice ordering food to have a more streamlined web-presence. Restaurants and chains are working on developing their own ordering system that is optimized by AI to showcase the most appealing content for their apps/web presence. Companies like KFC are even collaborating with Alexa to integrate voice-AI into the marketing mix. Alexa owners can ask it to order some KFC via simple voice command. The device even shares engaging insights from the life of the founder as well. This is a great way to extend the story of KFC and incorporate a unique food ordering system as well. Through this voice-enabled AI process, they’re trying to build a new category within the food ordering domain. While we’re seeing innovation features and functions of core AI, companies need to continue innovating to get the most out of the core technology. If you need a fully functional AI integrated food delivery app for your business, hire our outsourcing team of AI developers. Our team has a proven record of successfully delivering the food apps for leading food chains. Thanks for the nice post. I welcomed here with nice post today.